Alcolado Glacial is a mentholated splash lotion that is produced on Curaçao and that over the years became part of the local custom. People in Curaçao developed a deep connection with it and if you ask around many people would be able to tell you childhood memories of how they grew up with this lotion and stories of how they use it. Alcolado Glacial is not only good for one thing but it has many purposes like relieving many different aches and pains. But what are the most common uses and the most memorable stories? On Curaçao we are lucky enough to have beautiful blue skies and a sun who loves us year around. That also means that year around locals need something to cool down. 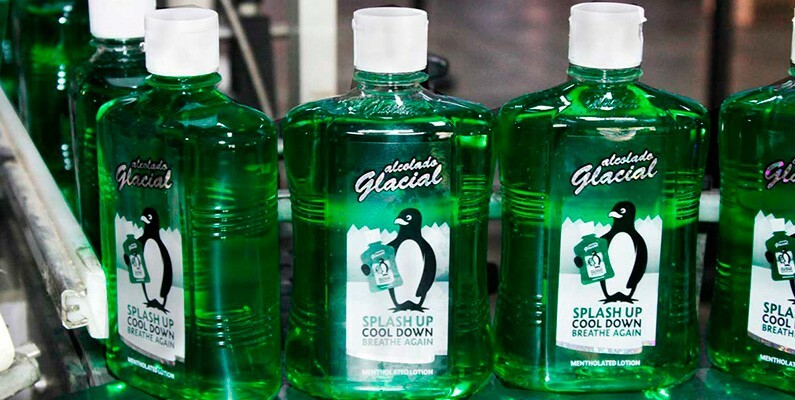 To refresh we splash a bit of Alcolado Glacial all over our body and we immediately start cooling down. This is why it’s also referred to as ‘the air-conditioning in a bottle’. If we ever feel a headache coming on then Alcolado Glacial is the perfect pain reliever. Many consider Alcolado Glacial a much better remedy than any other aspirin. Because Alcolado Glacial is a mentholated splash lotion it is a great product for relieving stuffed nose, but also other cold or flu related symptoms like a headache or body/muscle ache. If there is one thing people on Curaçao turn to when they have a stomach ache it’s their Alcolado Glacial. The splash has helped many when their stomach wasn't in its best shape. Nothing is more annoying than having mosquitos use your body as their appetizer, main course and dessert. The itch afterward is horrible, which is why locals often use Alcolado Glacial to relieve the itch of mosquito bites. Anyone who comes from abroad is stunned to hear that Alcolado Glacial is good against mosquito bites. But, it only takes one try for them to fall in love with it. Through the years people have discovered new ways to use Glacial. They use it for muscle pain, to remove makeup, as an aftershave or even to give a massage with it. Even though the product was never intended to serve these purposes, eventually they became part of the way people use Alcolado Glacial. But, many people also have fond memories of using Alcolado Glacial. Many babies on Curaçao are bathed in water with Alcolado Glacial before being put to bed. They will feel completely refreshed which helps them fall asleep much better. This practice has prevailed even in adulthood. Nowadays adults with sleeping problems will first splash a bit of Alcolado Glacial on their body in order to sleep through the night. Also, kids who are part of a scouting group will go camping at least once a year. No scouting kid can leave home without their mom putting an Alcolado Glacial in their bag—whether they like it or not. Moms believe that if they are not there to protect their kids against insect bites, Alcolado Glacial is the next best thing.